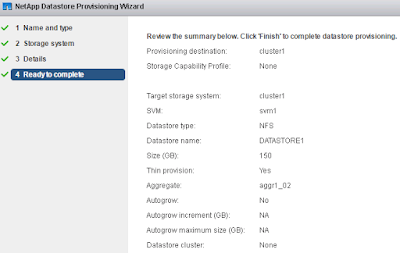 Cosonok's IT Blog: Q: How does VSC 6.2 Create NFS Exports for VMware? Q: How does VSC 6.2 Create NFS Exports for VMware? If for whatever reason, you don’t have access to the NetApp Virtual Storage Console for VMware, but still want to export a volume over NFS from your Clustered Data ONTAP system to VMware, this information might be useful to know. Q: How do we do this from the Clustershell without VSC? We’re going to do something a little different here and create a separate export-policy for our ESX cluster, also remembering that the SVM root volume needs to be exported read only, and that there’s likely to be load-sharing mirrors protecting the SVM root volume. Note: To keep the output brief, the above has only one host, for more hosts add more rules. Note: 192.168.0.134 is the local (on the same node as the volume) NFS LIF on the SVM.